1 Mobile Hackspace Project - "Go Anywhere, Build Anything!" 2 Go Anywhere, Build Anything! 4.5 How will this be funded? 4.6 Stuff we'll want in the van! Mobile Hackspace Project - "Go Anywhere, Build Anything!" Starting at Edinburgh HackLab and travelling south through the UK and Wales to Penzance Open Shed passing through several major cities on the way possibly visiting Hackspaces and other places of interest with the Mobile Hackspace. Something like this to include a few major towns. Anything on the South Coast of near London would be on a seperate tour. In 2010 some friends and I founded the Nottingham Hackspace, now a huge workshop filled with tools and space to work on nearly any project. Nottinghack has a thriving online community and over 120 members who pay monthly to use the space. Members and visitors share skills and get inspired by the space and the things they can make in it. A lot of the effort of Hackspace has been getting people to come to the Hackspace and see how awesome it is. Now I want to take Hackspace to them by putting it in a truck and taking it on the road. I am excited by self education but I'm also becoming more interested by STEM or STEAM as I prefer to think of it. I especially feel influenced by thisYou Tube of [ Gever Tulley]. A Hackspace is more than a workshop with tools in it. A Hackspace includes the community built around the space. If you simply hire a room and fill it with tools and there isn't a community, that isn't a hackspace. The Mobile Hackspace Project is a personal project of Dominic Morrow acting as a part of the Hackspace Foundation. Mobile Hackspace project is a working title for this project. The idea is to equip a vehicle with all the key equipment of a Hackspace and take that Hackspace to the hackers, wherever that may be. The mobile hackspace would provide tools, especially higher end technology used for prototyping or fabrication of nearly anything anywhere. Can't think of anything else now. More stuff to come. I will be trying to get £10k of funding. Kickstarter requires a project to be funded rather than a business so my project is create the Mobile Hackspace and then take it on a tour of the UK something like John O'Groats to Lands End the idea would be to visit the Hackspaces and other institutions that have funded the mobile Hackspace. The Nottingham Hackspace started as a group meeting in the pub. We had no real space of our own at all and almost no tools, litterally what we could turn up with. We had a lot of fun in those days. Ironically we were spending more in the pub in one night than many of us pay in membership for a month! In those days we could only dream of having the sort of prototyping tools we have now at the hackspace, those tools have opened up the possibilities of what we can make, inspired us to learn more and helped us to continue to grow the hackspace. What if we could take that inspiration on the road? At the EMF Camp we tooled up my van with the Hackspace laser cutter, we also took loads of handtools, a vinyl cutter, soldering irons and other items. When members of the Nottingham Hackspace went to the EMF Camp we wanted to create a focal point for the camp that was an actual Hackspace. We were keen to have the one place at the event that people could make things and this proved to be a considerable draw. The laser takes up almost all of my Kangoo. We used tap water (very naughty) in the big orange gorillatub at the front of the van and pocked the extraction out the side door. Prior to the camp I was worried about folks messing about with the laser in the night time so putting it in the van meant I could lock it away. In the end I didn't need to lock the van up. My other reason for putting the laser in the van was to have a steady and stable work platform. The trestle tables we took are notoriously wobbly and week. On reflection a bit of hardboard and a couple of hay bales might have been a good solution. In a mobile Hackspace the laser would be bench mounted. Though it looks like a shanty, the Hackspace village became a focal point for making. Though we weren't that well equipped and we had to adapt to being in a field it did seem that what we provided was very useful. The domed event shelter at the back of my van will be used with the mobile Hackspace at other outdoor events. Back in May the Feild Stuudies Council hosted a hackday looking at how to bring the advantages of mobile technology to teaching geography and related subjects in the great outdoors (stacks of info on the website and blog). Part of this weekend involved Bristol Hackspace "curating" a pop up hackspace in the Soil Lab at the centre. Essentially this was approx £700 of consubables, components and a few tools, plus what Brizzle could get in the back of a car, plus some other contributions. In a space that could have been designed for hackery (stone benches, stacks of natural light, no fire hazards AT ALL, good power supply) this lab provided a great facility for any and all hackers who wanted to get a 'bit physical' with their innovations. you only need as many tools as you can use, and you can only use as many as you have skilled people for- it comes down to people. it takes not much time to set up a space out of a car (perhaps a couple of hours) and half that to break it down and pack it up. 4 Doors, cargo area door include steps and hand rails. This Luton van is a "Walkthough" meaning that the back can be accessed from the drivers cab. It's designed for delivery companies so the driver doesn't have to walk all the way around the outside to get packets. It doesn't have many seats but that is okay. Unit is spacious and has sufficient space on the left and right possibly for a workbench on one side and storage shelving on the other. There is also space for stuff above the drivers area. It has walkthrough access from the cab as well as a side and rear door. The image below is based on a compare the market quote for insurance making a few assumptions. It would not include public liability and content, also I'd need to factor the cost of parking the Mobile Hackspace too. For the cost of moving the Hackspace (includes fuel, overheads and driver), any UK Hackerspace or group can hire the mobile Hackspace to use as a platform for their group at an event, other Hack-day or whatever. The Mobile Hackspace can easily be re-branded with vinyl banners to become an extension of that Hackspace at any other venue. Additionally one of the key benefits of the a Hackspace is the skills you can find or share within. On disadvantage of the mobile Hackspace idea is that unless it's filled with seats and people willing to give their time for free, it may be short on a pool of skills and knowledge. There is already a good strong network of friendly Hackerspaces around the UK and around the world. By keeping closely intouch with these and also being visible at their events, they can use the mobile Hackspace as a focal point for outreach or simply get involved locally at an event mobile Hackspace is attending. I intend to run a campaign on the UK launch of Kickstarter.com. Kickstarter say that it will launch in the UK in Autumn 2012. I will need to make a video and will be looking for volunteers to speak about Hackspace and what it means to them. Stuff we'll want in the van! The mobile Hackspace will be kitted out with lots of tools and materials to make things. It should be able to facilitate groups of around 10 makers (outside) and 2 to 3 maker insider working with the CNC tools (laser, vinyl cutter etc). The cargo area should include an electronics lab work bench with bench power supply, components, scopes, good lighting, ventilated solder fan and a multimeter. Most importantly there will be space to put folding tables, chairs and event shelters. The outside of the mobile space will include power outlets, lighting and awnings to allow for a larger "Hackspace" to be set up around the van. secure locking, mobiliser, secure points to lock kit inside as well as a tracker? Ideally the vehicle could run on carrot juice and be very environmentally friendly. Budget suggests it might have to save the planet some other way. Bio-diesel seems plausible as does LPG conversion (though I am not sure what difference either option makes to emissions). Having it's electrical power (when not in motion) at least partially solar and wind would be great. Remember the Gastrowagon? I have something in mind like "The Gastrowagon" from Cook on the Wild Side, an early 90s Hugh Fearnley-Whittingstall show about cooking stuff you find. The gastrowagon was very cool. He lived on top of it in a box, it had water, an oven and all sorts of other stuff that opened out the side of it. What appears to be the remains of the gastrowagon and a chap doing it up! I like Land Rovers a lot anyway so that might influence my decision somewhat. 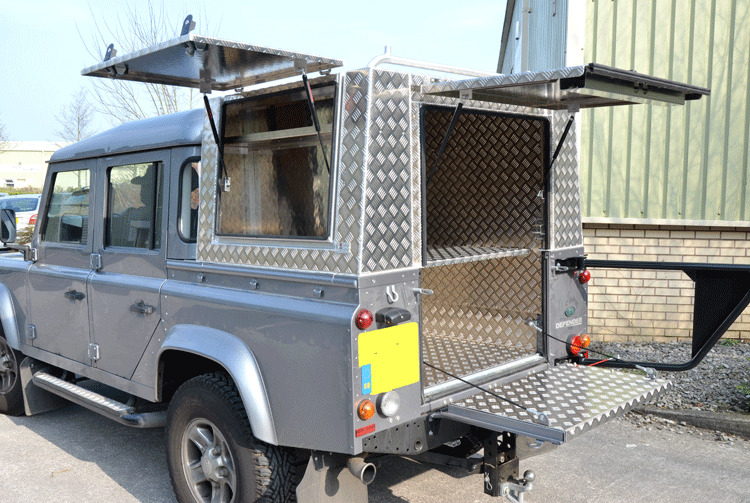 Here is a great page of Land Rover 130 Quadtech's and Workshops for sale! It's always tempting to consider novelty vehicles like this one. These are not at all practicle, they are expensive to buy, run and insure. They are not fuel efficient or reliable and the draw of their coolness does not out weigh the disadvantages of their size and limitations. Likewise I am avoiding anything special like this Oops, hi yes that was me with the pinzie- gotta love that Witham Specialist Vehicles site. Look for Combat Engineer Tractor. Then take a cold shower. Converted Motorhomes- if you rip out the kitchen and washroom of an old high top camper you can fit in a remarkable amount of rackmount equipment, in standing headroom too, and in insulated comfort. UPS type van or any van you can walk into the back of from the drivers seat. I love that. Why don't you get a bus that would be cool? True, it might be cool and old buses might not cost as much as you think. At the Manchester Mini Maker Faire I spent some time talking with Andrew Teverson of The Stage Bus, a double decker dus (not a route master) that converts into a stage with large sound system, lighting, dressing room etc. Apparently on the top deck there is a kitchen and bedroom with bunks though Andrew (who was rather tall) said he bangs his head on the ceiling a lot and that it's hot in summer and cold in winter. Of driving the bus Andrew said that technically anyone with a Full UK Driving Licence can drive upto 8 people in it. However he said he has an HGV licence which makes insurance considerably easier to get. Andrew said the bus cost about £3k but that the refit had been more. They have to store it at a caravan storage place and this costs them about £2k a year. Insurance covers the bus and contents I think and he said that it was expensive. I think Stage Bus is a great idea and I certainly plan to hire it if I ever have a suitable event. I think the model it uses as a business is a good one and very similar to how Mobile Hackspace might work. This page was last modified on 5 February 2019, at 12:27.